Olay and Crest want to help you brighten your summer! Keep your skin soft and moisturized with Olay’s newly enhanced Total Effects moisturizer. It contains 40% more vitamins AND has the highest level of Niacinamide in an OTC Olay skincare product. You’ll want to show off your smile after using Crest Luxe Supreme FlexFit Whitestrips. They use FlexFit, an advanced technology that allows the Whitestrip to stretch around your smile’s unique curves. Save the money you’d pay on a $500 in-office professional treatment at your dentist and use this product instead. I’d like to try the Olay moisturizer! Looking for a good one. Thanks! The white strip because I am a coffee drinker. Eager to try thr crest white strips ! 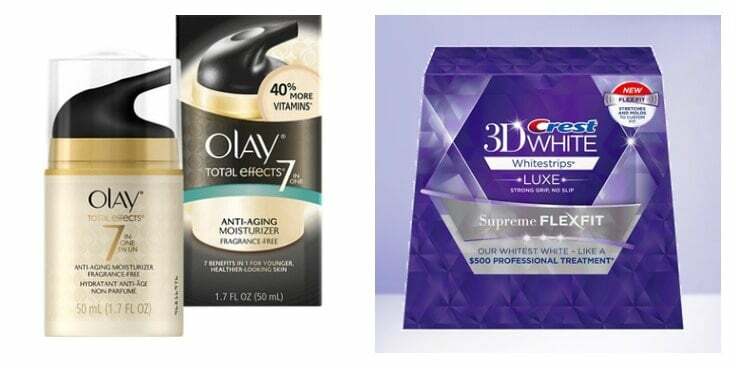 I’m looking forward to the Crest 3D White Whitestrips Luxe Supreme FlexFit the most. My teeth have always been a concern of mine. I want to try the Oil of Olay.